Bjarke Ingel’s newest building compels us to make the equivalent of Sophie’s choice between climbing up to it and skiing down from it! 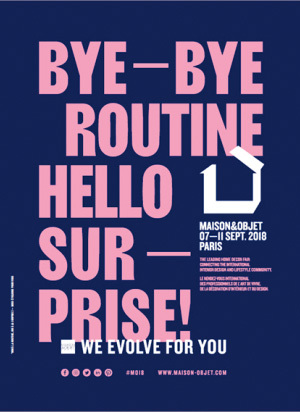 With a rather fat bank of numerous landmark projects situated all over the world, he has constantly evolved from project to project, finding solutions to the varying demands of particular clients and sites without imposing his own aesthetic dogma. The Danish architect is omnipresent in Copenhagen despite the fact that he has done fewer projects there in comparison to other cities all over the globe. One can be sitting in one of his structures that quite possibly would overlook another – this could easily happen! 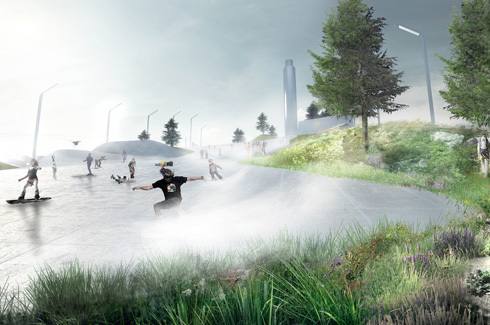 One such project we are going to talk about at The Inside Track today is the Amager Resource Center – a waste-to-energy plant located in an industrial area that over the years has turned into an extreme sport destination for thrill seekers. Different extreme sports activities take place in the raw industrial facilities such as cable wakeboarding, go-kart racing and rock climbing among others. The Amager Resource Center is the most significant landmark in the area and the building was in need of renewal. BIG proposed a new breed of a waste-to-energy plant; one that is economically, environmentally, and socially profitable. 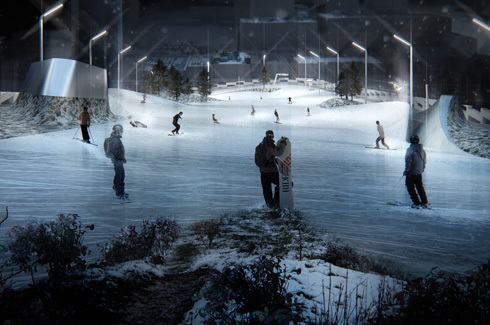 Instead of considering Amager Resource Center as an isolated object, BIG mobilized the architecture and intensified the relationship between the building and the city – expanding the existing activities in the area by turning the roof of the new Amager Resource Center into a ski slope. Referencing traditional architecture inside and out, ARC is unlike any other structure on this planet. The billowing ARC, or Copenhill as the locals call it, is a tree-filled ski slope and hiking area to be open year-round which will zag down its façade and one side of the building will feature a 278-foot-high artificial climbing wall. The design concept, as if pulled out of a sci-fi fantasy film, is the kind of thing that pretty much only Ingels could conceive of, and in turn convince a client to pay for. It’s also practically the opposite of another structure called Noma, an experiential restaurant that is across the boundaries of vision. Both designed by BIG and overlooking each other demonstrates the diversity of the talented architect. 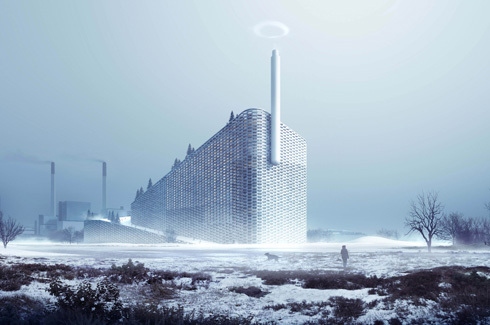 The new plant establishes Amager Resource Center as an innovator on an urban scale, redefining the relationship between the waste plant and the city. 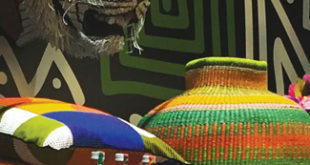 It will be both; an iconic and integrated destination in itself, and a reflection on the progressive vision of the company. 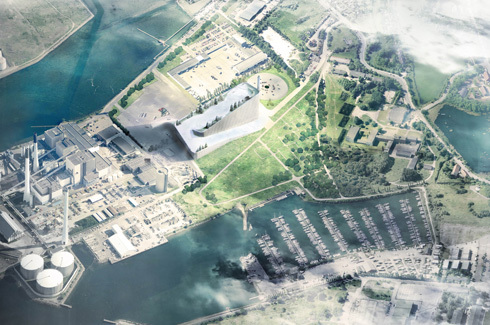 Masterplanned by BIG, the rooftop park atop the Amager waste-to-energy plant will host hiking trails in addition to the climbing wall as well as a 600 meters long slope that is accessed by an elevator adjacent to the smokestack. The elevator has a glass wall facing the interior of the plant allowing recreational buffs and sightseers to have a glimpse into the internal workings. The roof isn’t only going to function as a ski slope but as on a real mountain with green areas, it will facilitate hike trails, climbing walls and maybe even a bike trail. In addition to these activities, there will be a viewing plateau and a café. The building is gently wrapped with a continuous façade made out of stacked aluminium bricks. The openings between the bricks allow a cascade of daylight into the deep process hall and the administration space. These bricks on the façade function as planters creating a green façade and giving the look of a green mountain with a white top from afar. A simple modification to the smokestack only allows it to puff one ring of smoke when one ton of fossil CO2 is released serving as a gentle reminder of impact of consumption. 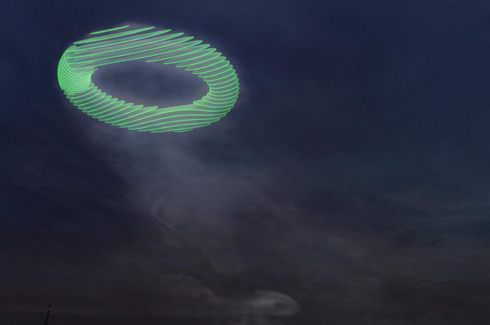 At night, heat tracking can be used to position laser light onto these smoke rings where the light source is placed on the smoke ring generator itself. The plant provides low carbon electricity to 550,000 people and district heating to 150,000 households and is possibly the most energy efficient plant in the world with 107 percent energy efficiency. This plant is an international showcase of how to combine today’s technology to achieve high energy efficiency. Over the years, waste-to-energy plants are becoming more and more useful for climate control and environmental wellness in general. 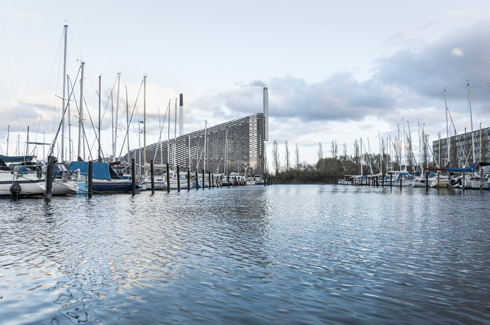 Fulfilling the technical as well as societal requirements, the plant gives back something more to Copenhagen than just an energy efficient plant. Benefiting the citizens of city, ARC provides cheaper and more sustainable electricity, district heating and recycled materials for at least the next 20 years and at the same time, they get to enjoy the view from the top in an exhilarating experience. 2010 marked the beginning of the construction of the Amager Resource Centre and over the years, despite being incomplete, has already won numerous accolade as well as the Progressive Architecture Awards citation and the 2012 AR MIPIM Future Projects Special Award. Practically a celebrity in the architecture world and with offices in Copenhagen and New York, Ingels has been named ‘Innovator of the year’ by Wall Street as well. 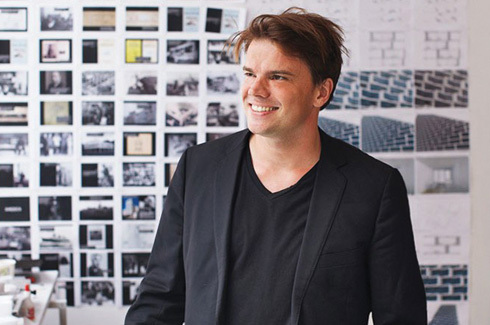 With a larger than life persona, incredibly superfluous media maneuvering skills, his visually jarring architecture and the sheer size of his portfolio, Bjarke Ingels is reshaping architecture one building at a time as we know it.